HA NOI (VNS) — Human rights, including the right of children to have good nutrition, were discussed by international members of parliament at a conference held here yesterday. The conference was organised by the United Nations Children Fund (UNICEF) in co-ordination with the Viet Nam National Assembly's Foreign Affairs Committee. The conference entitled The role of parliamentarians in the fulfillment of children's right to nutrition followed last week's Inter-Parliamentary Union meeting. Participants, including parliamentarians from around the world, Vietnamese and international specialists on women and children raised a series of issues on ensuring the rights of mothers and children. They also shared experiences, debating the effective participation of parliaments. They also focused on the negative side of private business involved in child care. 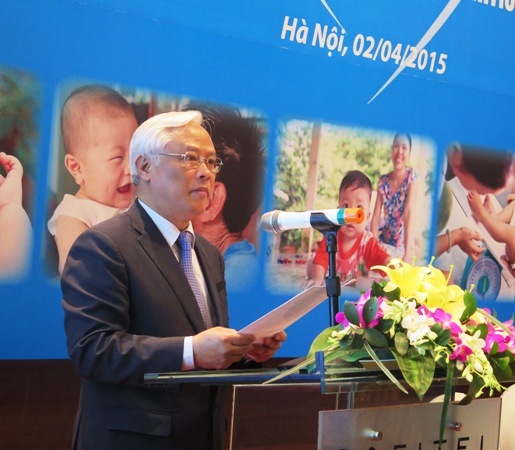 Vice Chairman of Viet Nam's National Assembly, Uong Chung Luu, spoke of the key role of parliaments in designing a legal framework for children's rights. He called for collaboration at regional and global levels in fulfilling chidren's right to nutrition. "Child nutrition is one of the important millennium development goals, contributing to the reduction of child mortality," said Luu. Christiane Rudert, a nutritionist from the UNICEF East Asia-Pacific regional office, spoke of the global picture of malnutrition with a focus on Asian countries. She also produced a global map showing the high rates of stunted children in South Asia and breastfeeding practices in the region. She said 161 million children under five were too short for their age, claiming that of the 51 million children that were malnourished, 17 million of them were far too thin..
Rudert said that severe wasting contributed to two million deaths a year. She also said about 42 million children were overweight and at risk of chronic illness, such as diabetes, and about two billion people were deficient in key vitamins and minerals, especially iodine, iron, vitamin A and zinc. Christine warned a prevalence of under-nutrition which remains unacceptably high despite economic and development progress. She said improved breast feeding could lessen the problems and called for a strong political commitment to scale up programmes. Sharon Garin from the Philippines said her country was implementing a national programme to bring nutrition to all children through their parents.